These Farm Heroes level 250 cheats and tips will help you beat level 250 of Farm Heroes. 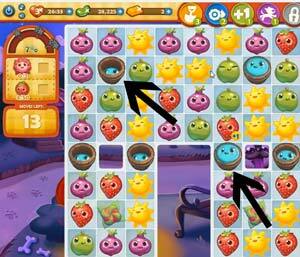 The objective of Farm Heroes level 250 is to collect two flowers and 50 strawberries in 15 moves. In this level you have 15 moves to collect 2 flowers and 50 strawberries. 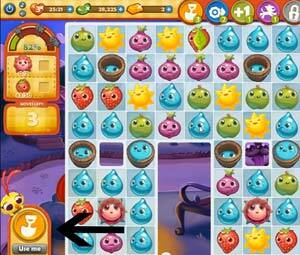 Although you do not need to collect water droplets in this level, the water buckets will help you to make moves in the bottom of the board where the flowers are. If there are no more options available to make combinations around the flowers, your only option is to add water droplets to the bottom of the board. 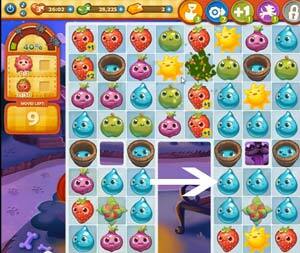 Once you have water droplets on the board, create combinations around the flowers to open them up. In order to open up the flowers, you need to make three combinations of three around them. Since there are not many resources at the bottom of the board, the only way to do this is to continuously fill up the water buckets. Keep track of how many strawberries you are collecting as well. If you still need help collecting one of the flowers, use the boosters! The shovel can help you to collect one of the flowers. The dog will help you to remove one of the resources from the board, allowing more water droplets to the bottom. And the tractor can clear an entire row, which would also allow more droplets to collect the flowers.